The dog’s spinal column consists of the spinal cord that is protected by the vertebrae. The intervertebral disks are structures that lie between the individual vertebra and act as a cushion between them. Each disk has a fibrous tissue outer layer called the annulus fibrosus that surrounds a soft inner core called the nucleus pulposus (similar to a jelly filled doughnut). 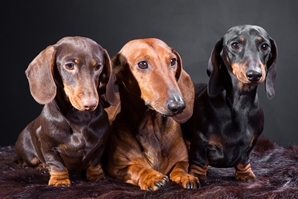 Intervertebral disk disease is a premature hardening of the center of the disk, and weakening of the outer layer of the disk that occurs most commonly in chondrodystrophic dogs such as dachshunds, however, we do see this problem in all breeds (rottweilers to chihuahuas). As the outer layer of the disk ruptures, the inner material is displaced upwards against the spinal cord. This herniated disk material injures the spinal cord and results in cord swelling and compression. Consequentially, the nerves within the spinal cord traveling to the legs and urinary bladder become damaged. This in turn results in loss of limb function that can range from weakness, ataxia (walking like drunk) to paralysis, and even loss of bladder control. In some cases, the damage to the spinal cord is minor, clinical signs are mild. In these cases, pain management (anti-inflammatory drugs and other pain medications), strict rest, and rehabilitation are beneficial. In other cases, the amount of disk material compressing the cord is too great and medical therapy alone is usually unsuccessful. These dogs require surgery to remove a section of bone over the spinal cord (hemilaminectomy), and to remove the herniated disk material in order to relieve the pressure on the cord. Before surgery can be done, an MRI is done to identify the area of the spinal cord that is involved. Unless there has been severe damage to the cord (from a neurologist’s perspective), most dogs will regain the ability to walk again. Some dogs have such severe damage to the spinal cord that they can no longer feel when their toes are pinched and are said to be “deep pain negative”. In this group of dogs the prognosis for regaining use of the legs can be poor. These dogs can still receive decompressive surgery to give them the best chance for recovery. Rehabilitation is very important to help all of these cases return to normal function in the soonest amount of time by maintaining muscle tone and joint mobility as well as helping to retrain balance and coordination while aiding in managing pain.